Bob and I once swore we would never live in a place where breadfruit didn’t grow. We kept good to this promise for eight years and then re-entered the world of winter. A place where breadfruit doesn’t grow. 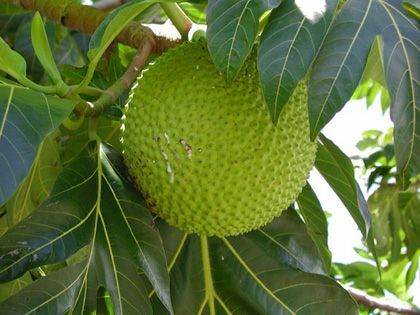 A place where 99% of the population has no idea what breadfruit even is. But, as I discovered with mangoes and peaches – when you move around the planet, what the left hand taketh away, the right hand replaces with something equally good. Peaches are one of my top five favorite fruits and peach pie remains my number one most favored and scrumptious dessert. When we moved to the tropics where there are no peaches, I discovered mangoes and decided early on that they were a suitable substitution. And the green coconut pie. Well, that was something from another world! Another sighed at dinner before announcing that “Someday, I’m going to go to the REAL rain forest.” “Real rain forest?” I asked, “What would you find there that you aren’t finding here in this rain forest?” “You know,” she said “where there are orchids hanging from the trees.” Our assistant manager, Rolando was seething, “Step into the forest with me now and I’ll show you all the orchids you want.” he said through his teeth. Never mind the enormous cubic yard of oncidium cascading from the Stinky Toe tree beside the barn. As a child, I recall my father driving me to Jersey through downtown Manhattan on a nippy fall day and while paused at the light, a vendor walking over to the car window and handing my dad a cone of piping hot roasted chestnuts in exchange for a couple of dollars. In case you don’t know, heaven on earth is a paper cone of hot chestnuts to share with your dad! 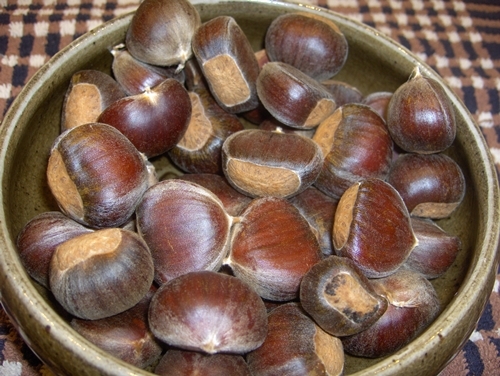 Now, I love chestnuts and always have. They are fluffy and nutty and sweet – almost like cake. The perfect balance of savory and sweet, protein and carbohydrate. In fact, chestnuts have a very similar taste and texture to breadfruit as it turns out. Every Thanksgiving of my childhood, I would sit at my Nana’s huge dining room table with her other seven grandkids awaiting the arrival of her incredible chestnut dressing. Never mind the turkey. And most years since then, I’ve made a point of bringing chestnut dressing to the Thanksgiving table. Hard pressed to find local chestnuts, I’ve had to buy expensive imported chestnuts, many of which were inedible, having molded from weeks of travel and storage. Alas, local chestnuts were unheard of. The mighty American Chestnut tree, once ubiquitous in North America, all but disappeared after a blight was accidentally introduced and billions of trees died from the foreign disease. Happily, chestnuts are making a come back in our area. A few weeks ago, Jason and Haruka discovered that Esta and Murray of Cohen Farm were selling chestnuts at the Farmer’s Market. They happily picked up a couple of pounds for us which we promptly roasted. Bob and I ate chestnuts to our heart’s content and froze a pound for Thanksgiving. These are exactly the kind of neighbors one can only hope for. Lyle had thought to plant chestnut trees on his property years ago and now they were bearing fruit. He and Tami are happy to share and willing to plant trees and wait years for the payoff. That’s when I had my moment of clarity. Chestnuts are food from the gods in the same way as breadfruit is. In the same way as strawberries, mangoes and peaches are. Every region has it’s own bliss. It’s up to us to seek it out and embrace it. It’s another cold morning, and Garth and I are walking across the frozen lawn to Edible Earthscapes, the farm next door. The birds seem impervious to the temperature. Garth carries a baggie of home made peanut brittle. I’ve come along to see the look on Haruka’s face when he hands her the sweet treat. Jason and Haruka grew the big, fat Virginia peanuts over the summer. Shelled by Bob, Amy and Garth, they are full of sunshine and energy, protein and fat and have flavor to die for. The peanut brittle came out perfect – golden, airy and scrumptious. Haruka’s face glows with a smile that warms the air between us. My day is already complete and it’s only 10am. Heading back to the house, I pass through the greenhouse. The air in here is tropical – warm, moist and alive. I close my eyes and inhale deeply, savoring the vibrant aroma of plants, sweat and soil. I’m transported. The world glows golden on the other side of my eyelids. This is bliss. Hours later I return to the greenhouse to find everyone hard at work. Brussel sprouts, Swiss chard and Butterhead lettuce are fluorescent in the late afternoon sun. The speakers pour music into the humid air. Haruka is planting seeds into trays. Jason, Amy and Garth are building a bed. 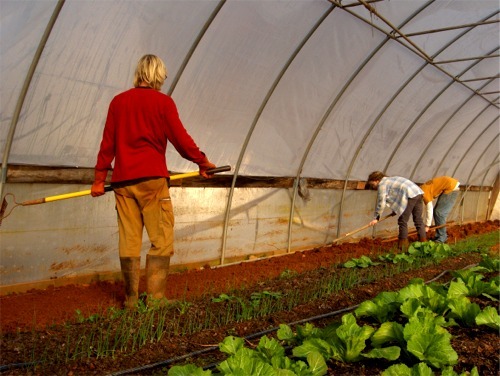 With broad forks and rakes, they break up the soil, rake it smooth and cover it with mulch. No petroleum based fertilizers are being used here. No pesticides. Again, the rich smell lifts me from my world of to do lists and deadlines into the real world. And when I step outside again, I recognize life all around me in what had seemed to be a frozen, dead landscape. 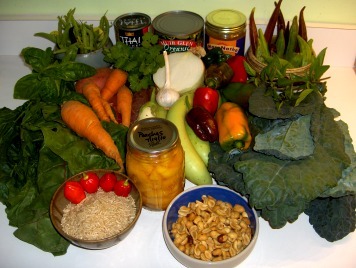 We share the bounty produced by Jason and Haruka’s hard work through our CSA boxes. In addition to greens, peanuts and dozens of other vegetables, they also grow rice and beans, which really excites me. Complete protein, right next door! In terms of self reliance, beans and rice are a huge accomplishment. Garth has been accepted as an apprentice and Amy plans on volunteering in exchange for learning the secrets of growing organic food. Their labor will feed us in the months to come. If the world economy were balanced, farmers would earn more money than bankers, politicians, investors and accountants. Instead, the folks who grow our food next door are working for peanuts. The summer squash is upon us along with tomatoes, cucumbers, potatoes and basil. There’s so much food that we can no longer keep up by simply turning it into meals. No two people can eat ten pounds of potatoes, ten pounds of tomatoes, and five pounds each of cucumbers and summer squash each week! We fully intend to eat all of our summer harvests, we just can’t eat it all now. So we are shifting gears into canning mode. Bob ordered a pressure canner at the same time Jeremy and Jennie expressed a desire to get some canning experience. Now, that’s a win-win if I ever heard of one. It’s been years since we canned. I gave away my old canning equipment in 1997, after we sold our house and before we moved to Belize. Now that we’re settled here in N.C., I’m really excited about getting back into the canning groove. Today, Bob and I sorted out a couple of closets so we can use them to store canned goods. Tomato sauce will surely be one of our first canning projects. We’ve got so many tomatoes coming in the door that we’ve taken to popping them whole into the freezer inside the back door before they even reach the kitchen. We took the biggest one over to the scale before freezing it, a great white which weighed more than two pounds! At some point, we’ll thaw and process them in our new canner. Jennie suggested peaches, but I’m afraid they will be out of season by the time we’ve given the new canner a trial run. Besides, I eat them too quick. Bob brought $10 worth of peaches home from the farmers market on Thursday and by I’m afraid I only have nine left two days later. I just can’t be trusted around fresh peaches. I tell them about the tomato tsunami going on at our house. Jeremy doesn’t like tomatoes but loves spaghetti sauce. We agree to turn tomatoes into sauce. Peppers are just now coming on and Bob has already harvested plenty of onions and garlic. But back to the zucchini and the yellow squash. Despite numerous opportunities to sauté them in a little coconut oil with onions, garlic and peppers, we are losing ground. Another good way to use summer squash is to make ratatouille. Sautéed onions, garlic, squash and eggplant go great with pesto and pasta but the eggplant isn’t quite ripe yet. With the tomatoes already in the freezer, waiting for our little canning party, I realized that I could do the same thing with the squash. It only took me about twenty minutes to chop and freeze three quarts of summer squash Now, when ratatouille season rolls around, I’ve already got a head start. Between the canner and our freezer, we won’t have any trouble keeping up with the garden and our CSA’s and we’ll be eating summer sunshine out of a jar come December! 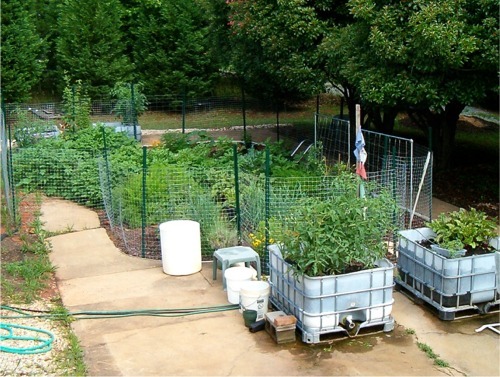 With all the CSA action going on around us, we hardly have to grow anything in our own garden. But Bob could no more stop growing food than a fish could stop breathing water, so this year he decided to plant more of the things we usually end up buying at the grocery store. That would be potatoes, onions and garlic. Now, of course we get some white potatoes in our CSA boxes and in the fall we get enough sweet potatoes to see us through the winter, but we like the whites so much, we end up buying them even in the summer. Bob and I come by our love of spuds honestly, being as how we both have Irish ancestors. We love them baked, boiled, roasted, in soups and salads, deep fried, scalloped and mashed with gravy. 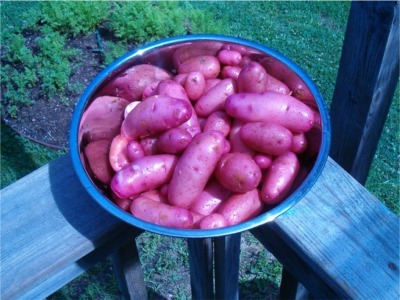 We especially like the creamy taste of fingerling potatoes, so Bob planted several varieties of those. The first potatoes to mature were the Red Thumbs. Planted in March, these ninety day potatoes were ready to harvest this week. Bob dug up the bed, set up wash buckets and brought in seventeen pounds of beautiful potatoes all cleaned and ready to throw in a pot or pan. What an amazing return on the initial investment of the pound of seed potatoes he used to start the plants! We had them with margarine and chives the first night. Baked with beets, onions and carrots (also from the garden) after that. Yesterday I made a tasty potato leek soup. Next up will be potato salad. Naturally, we’re sharing them with our neighbors, too. Potatoes have a higher ratio of readily available protein (when eaten with their skins) than soy beans, which explains why the Irish population doubled from four million to eight million in only sixty-five years after potatoes reached their shores from the Andes. For those of you unfamiliar with the great potato famine, there’s a lesson to be learned. Mono cropping can be fatal. Unlike the Incas, who preserved potato biodiversity by cultivating thousands of varieties, the Irish farmers grew primarily only one kind of potato – the “lumper.” Tragically, a blight struck down the lumper, causing them to rot in the fields and a million people starved. Another million fled to the new world, likely our ancestors among them. I’m keeping an eye out our kitchen window for Bob to dig up more tasty tubers as the other potato beds mature. And while fingerlings don’t store well, I think we can keep up with them. It’s hard to imagine ever having too many potatoes! Earlier this month, Bob and I took a couple of weeks off for our annual road trip north to visit family and friends. Those 1500 miles on the road in Blanche, our Mercedes 300TD “Hoopty Ride” wagon gave us plenty of time to chew on things. Beets do double duty, providing greens as well as the sweet beet root. Cabbage is magic and extremely versatile. Much of the world subsists quite nicely on a diet of beans, rice and cabbage. Nearly every meal in our home begins with an onion. We both have Irish roots, so potatoes are a must. Plus they are delicious, satisfying and store well. Tomatoes are indispensable for TLTs (Tempeh, Lettuce and Tomato Sandwiches) in the summer and spaghetti sauce in the winter. Well that only whet our appetite, so we went on to create four more top fives. We already have more than 25 vegetables and herbs growing in our garden and have yet to add artichokes, cabbage, or sweet corn. And we’d need a bit more acreage to grow enough beans and grain to replace what we currently buy. Lucky for us our neighbors at Edible Earthscapes are growing black beans and rice. At the end of the day, it’s fun to make lists and I feel confident that if we were limited, we would live a healthy, happy and sustainable life eating our top 25. Editor’s comment: What? No rainbow chard? Ok, dear readers, tell us what’s in your top five. This week Bob and I found ourselves with a couple of pounds of parsnips. I wasn’t sure what to do with them but decided to give them a chance. So I went to my computer and found a recipe for “Sweet and Gooey Parsnips,” which involved carmelizing them with nutmeg. Looked promising. I got right to work, peeling and chopping up the hard, little roots. I spent enough time with my pile of parsnips to begin seeing pictures in the horizontal lines. I superimposed the face of a farmer atop one craggy, dirt-stained root in an attempt to visualize the person who grew these pale, pithy wonders. All it needed was a tiny straw hat! Meanwhile, farmer Jason of Edible Earthscapes came over and was enjoying some of his home brew on the back porch with Bob. As the parsnips simmered away in the pan, I walked outside and asked Jason “What do you do with parsnips?” Bob laughed because he had just asked Jason the same question. Jason had told Bob that Fall parsnips were one of his top five favorite vegetables and that Spring parsnips with their winter-hardened root cores were only good for the compost pile. “Great,” I said, “I find this out now!” As I turned to go back inside the house, Bob was already making plans to plant parsnips for Fall harvest. I checked on my pan of parsnips. The nutmeg complimented their flavor nicely and some of the pieces had indeed turned sweet and gooey. 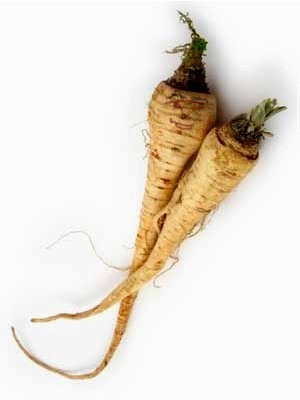 Unfortunately, nearly all the gooey parsnip morsels were hiding an inedible, woody core. 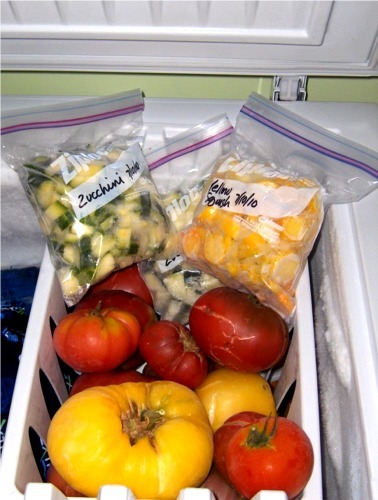 Unwilling to throw them on the compost pile just yet, I put them in the refrigerator. The next day, I decided to turn those parsnips into soup. Soups are something I’m really good at and this would be a cream of chard/kale soup with pureed parsnips. I started re-heating the cooked greens and on a whim, added in some acorn squash I’d frozen last fall. I heated up the parsnips and pressed them through a sieve, leaving all the hard cores behind. Adding soy milk, I pureed all three vegetables and added a few spices. Voila! I had made a big pot of something resembling Baby Food! Well, there’s no baby in our house and I don’t know anyone who would feed what I made to their child. My “soup” had bad color, consistency and flavor. Well, I could thin it down some, I thought, reaching for some vegetable broth. I was on the verge of chopping up some chives to add in when Bob walked into the kitchen. Seeing what I was up to he said, “Let it go – it’s enough already!” Putting the knife down, I picked up the pot of gooey green puree, walked outside and poured it over the compost pile. Compost piles need to eat, too, throwing good energy after bad is never a good idea and if you are afraid to make mistakes, you will never learn anything. Knowing when to let go is as important as knowing how to dive in. And I’ll probably be ready to give parsnips another go in the fall.